Christopher Columbus is famous because he found something he wasn’t looking for. In 1492, Columbus sailed across the Atlantic Ocean in search of India. What he found was something far different. He found the New World. How did this come about? It all started in Italy. Christopher Columbus was born in Genoa in 1451. His family didn’t have a lot of many, and Christopher wasn’t an only child. He didn’t have much of an education until he was much older. Instead, he went to sea. He sailed around the Mediterranean and as far north as England and Ireland. When he was 25, he was shipwrecked and found his way ashore to Portugal, where he later lived with his brother. He met the woman who would be his wife in Portugal, too. Sadly, she died soon after their son, Diego, was born. After that, Columbus took his son to Spain. During his travels, Columbus had heard sailors’ reports of land to the west of the Madeira and Azores Islands, which were in the Atlantic Ocean west of Portugal. He wanted to know more and got maps and books on geography. (Fortunately, he had learned Latin, the language used on most maps.) These books and maps suggested, based on stories of Marco Polo and others who traveled to Asia, that the Far East wasn’t all that far away. was larger than it really was. As a result, Columbus was convinced that Japan was only 3,000 miles west of Portugal. And 3,000 miles was a distance that ships could travel in those days. Add to this the fact that trade routes overland from Europe to the Far East were too slow for many traders. Also add to this the fact that trade routes by sea from Europe to the Far East were still too slow for many traders. Finally, add to this the idea (which was generally accepted by this time) that Earth was round. Columbus knew of the great reputation of Portugal in exploration. Prince Henry the Navigator had been sending ships to explore Africa and the East for years. Columbus asked Portugal’s King John II for money and ships for his voyage. King John refused, so Columbus went to Spain. At first, King Ferdinand and Queen Isabella also refused. Columbus tried for seven years to get them to accept his proposal, but they kept on saying no. Finally, he told them he would move to France and ask the French king for help. The Spanish king and queen finally said yes. Columbus spent the early months of 1492 getting ready for the voyage. His three ships–the Nina, the Pinta, and the Santa Maria–set sail from Palos, Spain, on August 3. 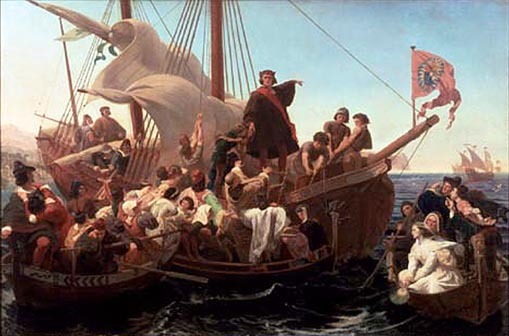 Columbus captained the Santa Maria. The captains of the other two ships were brothers, Martin Pinzon (Pinta)and Vicente Pinzon (Nina). The voyage across the Atlantic Ocean was long and frightening to many of the sailors aboard Columbus’s three ships. They threatened mutiny. Columbus himself was worried when they did not see land for many days. He promised his crew on October 10 that if they did not see land in the next three days, they would turn back. On October 12, they saw land. They landed at San Salvador, in the Bahamas. They met friendly natives there and then sailed on to Cuba and to Hispaniola. There, the Santa Maria was wrecked. 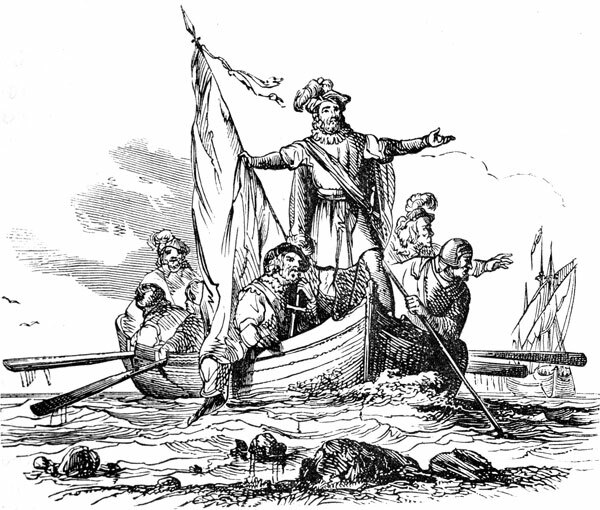 Columbus got his men ashore and onboard the Nina. Then, they headed back to Europe. Isabella. Each time, Columbus made the claim that he had reached islands very near Asia. He showed gold, artifacts, and even natives that he had brought back with him. Spain’s king and queen were so excited that they almost immediately gave him money and ships for another voyage. Columbus set sail on his second voyage in September 1493. He had 17 ships this time. They landed in the Lesser Antilles in November. They traveled on to Hispaniola, to Natividad, a colony founded by sailors who had stayed behind when the first voyage had returned home. When Columbus arrived, he found the colony empty. The Spaniards had tried to take over the area and had been killed by the natives. Columbus founded another colony east of Natividad, naming it Isabela. He traveled around Cuba and Jamaica, then decided to return home again. His brother Batolome stayed behind on Hispaniola and founded Santo Domingo, the first permanent European settlement in the New World. Columbus arrived back in Spain in 1496. There wasn’t much change of a third voyage until Portugal’s Vasco da Gama landed in India in 1497. Spain quickly wanted to catch up, so it sent Columbus back to the New World with six ships. They arrived on the island of Trinidad in July 1498 and then traveled on to the mainland, discovering South America. Columbus sailed back to Santo Domingo and found more trouble with Spaniards left behind. A royal commissioner from Spain soon arrived, blamed Christopher and Bartolome Columbus for the trouble, and had them both arrested and put in chains and then sent home in disgrace. The king and queen freed him and even gave him money and ships for a fourth voyage. This one left Spain in 1502 and sailed to the island of Martinique and then to Honduras, in Central America. After more exploring in the Caribbean, Columbus returned home to Spain, in 1504. He died two years later, still believing he had reached Asia. • You could get to the East by sailing west. Ferdinand Magellan’s voyage proved it several years later. • You could sail to the New World and back. Columbus did it four times himself. Why do you think the explorers called the Americas the “New world”? Who lived on the land when Columbus arrived? What country paid Columbus to travel? Why do you think the Natives killed the Spaniards? Each of these defendants is charged with murder—the murder of the Taíno Indians in the years following 1492. Tell them that, in groups, students will portray the defendants and that you, the teacher, will be the prosecutor. Explain that students’ responsibility will be twofold: a) to defend themselves against the Each student will state who they believe is guilty and why. your first act in tHe lands you “discov- ered” was to take possession of another people’s territory in the name of an empire thousands of miles away. From the very beginning of your time in the Indies you kidnapped Taíno Indians. Even when they attempted to escape, making it clear that they wanted to leave, you refused to release them. On your second voyage to the Indies, you ordered your men to round up Taí- nos and had over 500 shipped to Spain as slaves. You told your men to help them- selves to the remaining Taíno captives, which they did. This act alone killed several hundred Taínos. In 1495 you started the policy of forc- ing Taínos, age 14 and older, to collect gold for you. Those who didn’t return every three months with the amount of gold you demanded were punished by having their hands chopped off. You ordered your men to spread “terror” among the Taínos when there was rumor of resistance. The list goes on. When you arrived on Hispaniola there may have been as many as a million or even three million Taínos on the island. According to one Spanish priest, by 1542 there were 200 Taínos left. There is no one to blame but you. You were Admiral, you were Viceroy, you were Governor of the island. Without you, Columbus’ orders to enslave and kill Taínos would have been empty words. There is no evidence that Columbus personally captured slaves or killed anyone with his own hands. You are the ones responsible for the enslavement of first hundreds, then thousands, of Taíno Indians. Without you there were no crimes. You may try to blame your superi- ors, Columbus or even King Ferdinand and Queen Isabella. But because someone orders you to commit a crime does not free you of the blame for committing it. You could have said no. There were Span- iards, like the priests Antonio de Montesinos and Bartolomé de las Casas, who refused to mistreat Indians and spoke out on their behalf. Why didn’t you? Without the soldier there is no war. Without you there would have been no genocide. Without your money, Columbus couldn’t have launched his plan to find the East Indies by sailing west. Without you, he was an unemployed sailor. You hired him to “discover” and claim new lands. Thus you are guilty of conspiracy to steal the territory of people you didn’t even know, who had never bothered or harmed you. When Columbus returned after his first voyage with several Indian captives, and you rewarded him, you became guilty of kidnapping. You could have ordered Columbus to stop kidnapping Indians. You could have punished him for this illegal act. By not doing anything to stop Columbus and his men, you legalized every crime they committed. anyway—but you never punished him for these crimes, which killed hundreds of human beings. Because you were the bosses and because you paid the bills, you have more guilt than had you been the ones wielding the swords and hangmen’s nooses. perhaps millions, of Taíno Indians. Spaniards? Had Taínos worked together they might have beaten the Spaniards even after Columbus returned. After all, the Spaniards numbered fewer than 2,000; Taínos numbered in the hundreds of thou- sands, possibly as many as three million. However, as a result of this Taíno failure, all the Native peoples of the Americas suffered. tHis gets complicated. You are not a person, but a system. We like to blame crimes on people. But in this case, the real criminal is not human. True, Columbus’ men did the kill- ing, Columbus gave the orders and King Ferdinand and Queen Isabella paid the bills—and took the profits. But what made them behave the way they did? Were they born evil and greedy? The real blame lies with a system that values property over people. system saw only white Christians as full human beings. It was life in a system that valued private property (especially gold), and approved of violence against foreigners and non-Christians to get it, that made Columbus and his men enslave and kill. Sane people do not kill hundreds of thou- sands of other human beings. It was a rotten, insane system that led Columbus and the others to behave the way they did. You, as the representatives of this system, are guilty for the genocide committed against Taínos. If it had been some other “explorer” besides Columbus to “discover America,” would he have let the Taí- nos keep their land? Would he not have made them search for gold and work in the mines? You know the answer: Any European conqueror would have been every bit as bad as Columbus. Why? Because the system of empire was to blame, not any particular individual. n — from the role play, The People vs. Columbus, et al.